Installing a mirror is an important job. Everyone needs to see what they look like before going out into the world. Women need to see well to put their make-up on, and the guys need to see to shave. Hanging the mirror is not difficult, unless you have a very large mirror. Then you may need some help lifting into place or holding while you mark for the hangers. There are basically two types of mirrors, framed and frameless. They require different methods to hang, so first you must know what kind of mirror you are going to hang. Measure your bathroom vanity and find the center. Mark the center on the wall over the vanity with a pencil. Measure the mirror and find the center. Mark the center of the mirror on the front with a dry erase marker. Hold the mirror up on the wall and position it by matching up the centers. Mark the edges of the mirror on the wall with a pencil just under the edge so you won't see it when you're done. Using a stud finder, locate two studs behind the drywall where the mirror is going. Mark them with a pencil, and using a level, draw a line between them so they will hold the mirror level. Attach the bottom two J clips to the wall at your marks with flathead wood screws 1/1/2 to 2 inches long. Attach the two top anchor pieces to the wall just below the line you marked for the top of the mirror. Slip the top two J clips loosely into the anchors. Place the mirror on the J clips at the bottom and hold against the wall. Push the top two clips down so the lip goes over the edge of the mirror. They will lock into place as you push them down. Screw eye screws into the back of the mirror frame on each side about 1/3 of the way from the top. Using the correct mirror hanging wire for the weight of your mirror, wrap the wire through one eye screw, wrap it back around the wire and knot. Leave some slack so the wire bows a bit, and attach in the same manner on the other side. Find the center over your vanity and mark on the wall with a pencil. Using a stud finder, find out if there is a stud there. If not, use a hollow wall anchor or molly bolt to hold the mirror. If it is a stud, you will just need a screw. Lay the mirror down and pull the wire up in the center. Measure from the bottom of the frame up to the top of the center of the wire. Use this measurement to know where to place your nail or bolt on the wall and then nail it in. Hang the mirror on the nail or bolt. 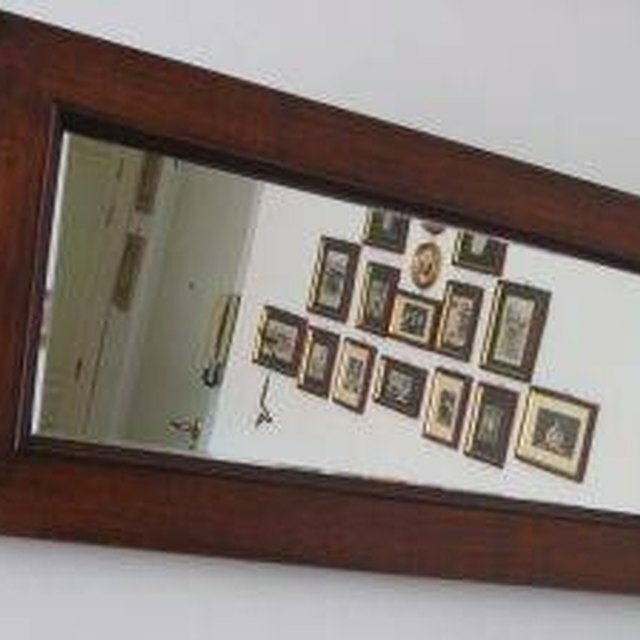 If your mirror is very heavy, you can install two nails on the wall, with one being in a stud. Just make sure the two nails are level or your mirror will hang crooked. Always wear safety glasses when working with glass, just in case you drop it or break it while you're working on it.